This post may contain affiliate links, which means that I may receive a commission if you make a purchase using these links. If you don’t have the room in your garden to plant potatoes or even if you have no garden at all, you can grow potatoes in containers. Here are some tips for growing potatoes in pots, grow bags, and buckets. There is nothing like the flavor of freshly dug potatoes. Potatoes are easy to grow and provide a nutritious addition to meals. According to the United States Potato Board, one medium-size potato is only 110 calories and provides a healthy source of potassium, iron, vitamin C, and vitamin B6. Consuming potatoes with the skins on contributes 2 grams of fiber. All the more reason to grow your own and avoid the chemicals sprayed on commercial potatoes. You don’t have to devote precious garden space to grow potatoes. Potatoes can be grown on a small scale in all types of containers in any area that receives at least 6-8 hours of direct sun. 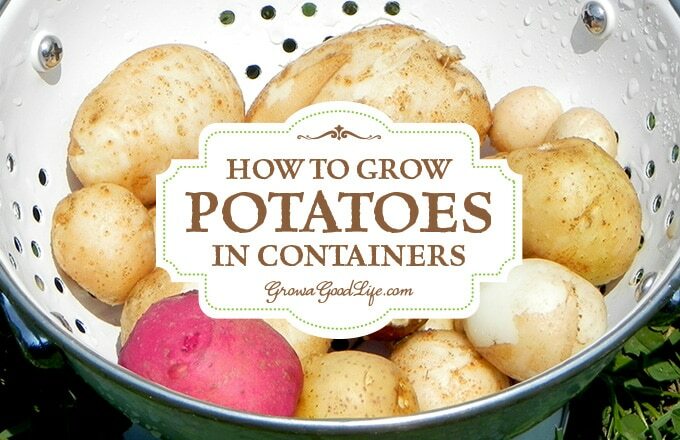 Consider trying to grow potatoes in pots, grow bags, buckets, or other containers. 1. No Soil Contamination: Since you are using fresh potting soil, you don’t have to worry about crop rotation, soil-born diseases, or pests left over from the previous growing season. 2. Containers can be placed anywhere: The containers easy to care for and can be placed on your patio, balcony, or in any spot in your yard that receives full sun. 3. Easy harvest: Harvesting the potatoes is easier than digging, and there is less chance of damaging the tubers with a digging fork or shovel. Instead of digging you just dump out the pot and there they are! 4. Potatoes are protected from soil pests: The container shields the potatoes from rodents and other pests in the garden soil. If you have a problem with moles, gophers, voles, or chipmunks tunneling through your garden and eating your tubers beneath the soil, growing potatoes in containers is your solution. Also protects from wire worms, grubs, and other pests. Early potato varieties are perfect for growing in containers because they mature quickly and produce their crop all at once. Early potato varieties usually mature within 65-80 days, or you can harvest new potatoes in about 6-7 weeks from planting date. Small, new potatoes have a sweet flavor with a delicate texture. Some early potato varieties include Chieftain, Dark Red Norland, Irish Cobbler, Sangre, Red Gold, and Yukon Gold. Fingerling potatoes varieties are also suitable for growing in containers. Fingerling potatoes are small, 2-4 inches long varieties that are narrow, finger- or oblong-shaped. Colors range from red, orange, purple and white skin with orange, purple, yellow or white flesh. Their flavor is mild, nutty and earthy, and their texture firm and moist. Some fingerling potato varieties include AmaRosa, Banana, French Fingerling, Pinto, and Rose Finn Apple. 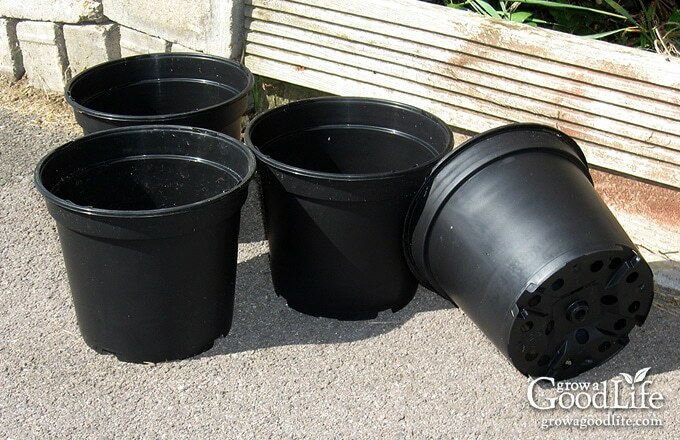 Large Pots: Large pots and planters are ideal for growing potatoes. Select a container that is at least 16 inches in diameter and 16 inches (41 cm) high. You can plant 4-6 seed potatoes in this sized container. These 10-gallon nursery pots are perfect. 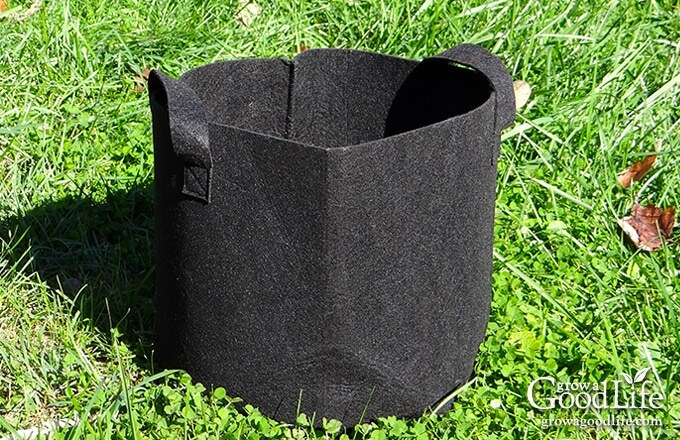 Grow Bags: Grow bags are made from fabric. The fabric helps prevent over-watering and allows air to reach the roots. Grow bags tend to dry out quicker than other containers, so keep an eye on your plants watering needs. Consider these 5-gallon grow bags to grow 2-3 seed potatoes, or these 10-gallon grow bags to plant 4-6 seed potatoes. 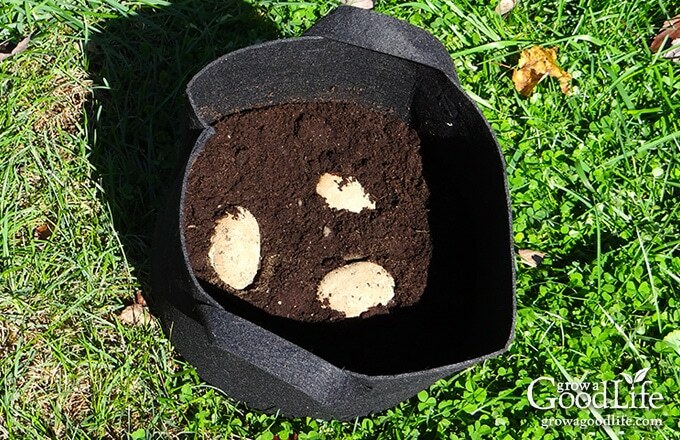 Potato Pots: These potato pots are made up of two parts, an inner and an outer container. You can lift the inner pot out to check on the progress and harvest potatoes, and then return the inner pot to the container so the plant can continue growing. Plant 2-3 seed potatoes in these containers. You can find 2-piece Potato Pots online at Amazon. 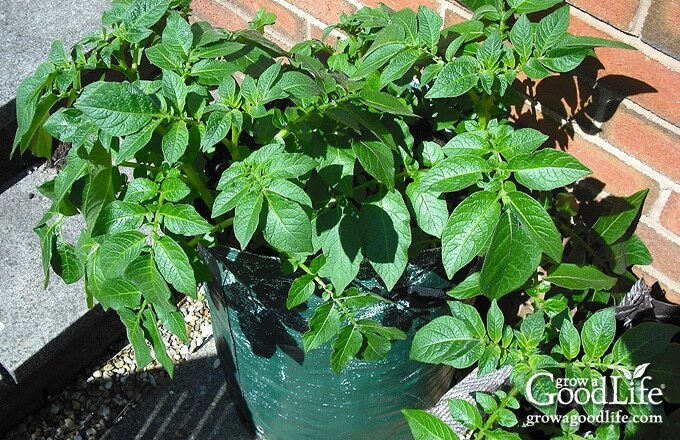 Large Buckets: Recycled 5-gallon buckets will also work well for growing potatoes. Drill holes in the bottom of your buckets to allow drainage. You can plant 1-2 seed potatoes in 5-gallon buckets. 2. Use a lightweight soil mix: Potting mixes specifically made for containers will work. If you are mixing your own, a good mix is 1/3 good quality finished compost, 1/3 vermiculite or perlite, and 1/3 coconut coir or peat moss. 3. Feed the plants: Add an organic granular fertilizer, such as Plant Tone to the container at planting time. Once the plants emerge from the soil, feed the foliage every two weeks with fish emulsion. Spray the plants early in the morning to give the foliage time to absorb the nutrients and dry before the hot midday sun. Follow the instructions on the packages. 4. Water well: Watering requirements of potato plants grown above ground are greater than in the ground. Since the soil is not insulated as well as in the ground, water evaporates quickly. The plants will stop growing if they become dry or overheated. Check the containers frequently in warm weather by sticking your finger in soil. Water your pots if the top two inches of the soil feels dry. Water deeply until the water drains out the bottom holes so the moisture reaches the roots at the bottom of the container. 5. Keep the tubers covered: Potatoes will develop areas of green skin when they’re exposed to direct sunlight during growth. The green areas are toxic and should be trimmed away. 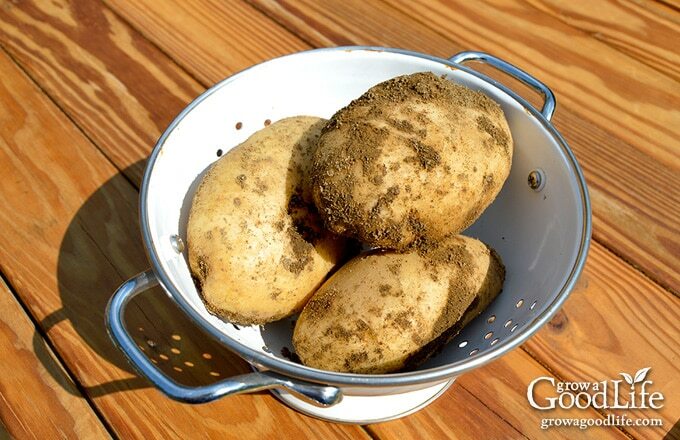 Prevent your potatoes from forming green skin by covering with soil or mulching heavily so no light reaches the tubers. 6. Grow potatoes in full sun: Potatoes thrive with at least 6-8 hour of sunlight per day. However, potatoes are a cool season crop that doesn’t like the heat. The plants may stop growing once temperatures reach the high 80s˚F. So if your weather is warm, try to locate your containers in an area that receives morning sun, then is partially shaded during the afternoon. Step 1. Add 6 inches of potting mix to the bottom of each growing container, mix in fertilizer, and place your seed potatoes about 6-inches (15 cm) apart. Step 2. Cover the seeds with 6-inches (15 cm) of soil and water well. Step 3. Once the plants reach about 6-inches (15 cm) tall, add more soil to the container. Repeat the process every 2-weeks or so until the container is full. You can begin harvesting new potatoes as needed for meals after the plants bloom. Potatoes are finished growing when their foliage begins to turn yellow. Stop watering at this point and allow the foliage to die. Dump out the container and dig through the soil for the potatoes. Want to Learn How to Grow Potatoes? 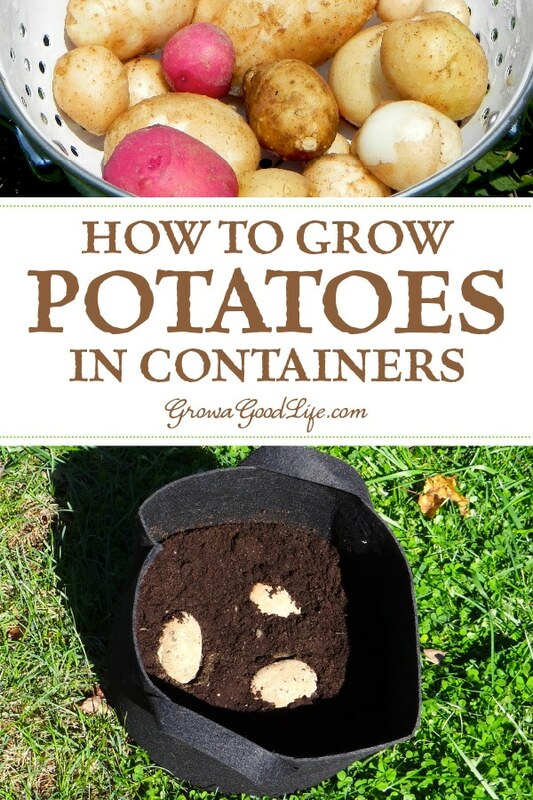 You will find everything you need to start growing potatoes in my PDF eBook, Grow a Good Life Guide to Growing Potatoes. Whether you are striving for a few gourmet fingerling potatoes or a large crop for winter food storage, this guide will show how you can grow your own, organic, homegrown potatoes. Click here to learn more. Good planning is key to a successful vegetable garden. 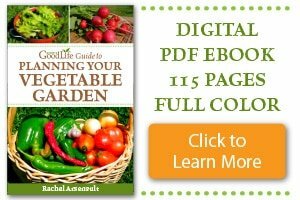 Whether you are new to growing your own food or have been growing a vegetable garden for years, you will benefit from some planning each year. 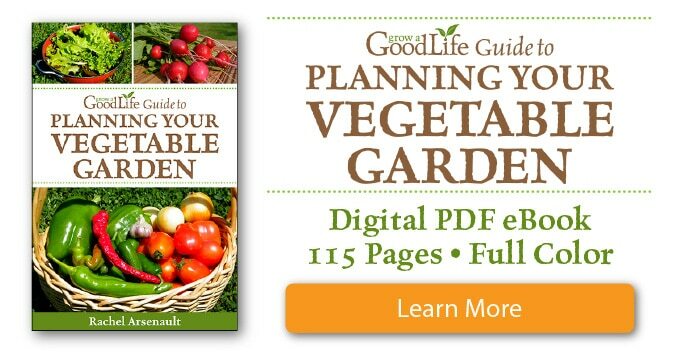 You will find everything you need to organize and plan your vegetable garden in my PDF eBook, Grow a Good Life Guide to Planning Your Vegetable Garden. I have never grown potatoes but I have some experience in growing tomatoes and some widely used herbs in Indian kitchens like cilantro, mint and basil. Your article has given me some serious motivation about trying my hands with potatoes. Keeping my fingers crossed. Thanks Rachel. Grow a Good Life uses affiliate links, which means that I may receive a commission if you make a purchase using these links. Grow a Good Life is a participant in the Amazon Services LLC Associates Program, an affiliate advertising program designed to provide a means for us to earn fees by linking to Amazon.com and affiliated sites. Full disclosure policy here.